Ginger Tea recipe’s main ingredient is fresh Ginger (Zingiber Officinale) slices or crushed ginger roots. Ginger is rich in healthy phytochemicals that provide a wide range of health benefits. About: Ginger (Zingiber Officinale) is a natural pungent spice has been used for ages by many cultures in cooking and medicines. Ginger root can be used fresh, dried or powdered. Most of the people especially in Asia and Africa use ginger to prepare a tea called ginger tea. A cup of ginger tea provides you relief from many uncomfortable conditions. Vitamin C, Vitamin B6 and magnesium are also found in the ginger roots. It also contains small amount of iron and calcium. However, ginger tea is prepared from very less quantity of the ginger roots, which may vary from 1 to 5 grams ginger root paste or ginger slices. Therefore, the caloric value of ginger tea is less than 6 calories per cup if no sugar content added. The amount of other nutrients in ginger tea is insignificant. Therefore, ginger tea may not likely to provide any nutritional benefits, but it has therapeutic value due to its water-soluble alkaloids and phytochemicals, which dissolves in water during preparation of the ginger tea. Take a cup of water in tea pan and add 1 tsp. crushed ginger. Boil water with crushed ginger for 5 to 10 minutes. Strain the ginger tea and drink it when it becomes warm. Leave it for a few minutes, so that it becomes warm. Do not add honey in hot tea. Add honey in the ginger tea when it becomes warm to preserve important nutrients of the honey and enhancing the therapeutic effects of ginger honey combination. Therapeutic Benefit of the Ginger Honey Tea: Ginger Honey Tea is more beneficial in common cold, cough with wheezing, chest congestion or white and thick sputum. If this tea is taken initial signs of common cold, then it prevents worsening symptoms and treats them effectively. Boil water with grated ginger for five to ten minutes. Add sugar or honey. If you want to add honey, then it should be added when tea becomes warm instead of hot tea. Strain and leave ginger tea for a few minutes, so that it cools down. Then mix some amount of honey as per your taste and then refrigerate it. Add lemon juice and serve cold. Add tea bags to the mug and steep for 3 to 4 minutes. Remove bags, add honey or sugar and serve tea. Normal tea powder 1/2 tsp. Mix normal tea powder, sugar, ginger paste in water and boil for 10 to 15 minutes. Add milk and boil for five minutes again. One can also add some additives to enhance the taste of the ginger tea and for improving a specific therapeutic value. Coriander Seeds Heartburn Or Hyperacidity & prevents side effects of ginger tea. Ginger tea has many medicinal uses and other ingredients like honey, lemon and additives increase the taste of it, as well as its health benefits. Let us have a deep look over all the health benefits of ginger tea. Ginger tea is beneficial in stopping the nausea. If you are going for long travelling then take ginger tea first. It will help in travelling bad effects like nausea and headaches. In addition, it is beneficial for people having nausea due to chemotherapy and some surgery. Taking ginger tea to relieve morning sickness or nausea in pregnancy is still controversial. So, be always confirming with your doctor or midwife if you are pregnant. In winters, ginger tea beats cold by increasing the immunity of the body. It is natural antiviral. It protects the body from the illness by increasing non-specific immunity. It has anti-inflammatory properties, which reduces inflammation of the respiratory tract. In addition, ginger tea is very effective against human respiratory syncytial virus. Ginger tea is also a good cough suppressant. It helps to clean and heal our respiratory system. Its warming action helps to remove mucus from the lungs and treats cough. The natural muscle relaxant effect of ginger tea relieves spasms associated with heavy coughing. In period days, some women feel very heavy menstrual cramps. In these difficult days, a woman should take ginger tea to get relieve from this pain. Ginger tea provides warmness in the stomach and gives normal flow of the liquid. It will relax the muscles and alleviate the pain. Ginger tea is used as a slimming formula because its properties that promote weight loss. It has thermogenic properties that activate body’s metabolism and burns fats and calories. Due to its antioxidants properties, it helps in the elimination of wastes from the body properly and in detoxifying the body. Ginger lemon combination is very good to lose the body weight. Regular intake of ginger tea helps you a lot. 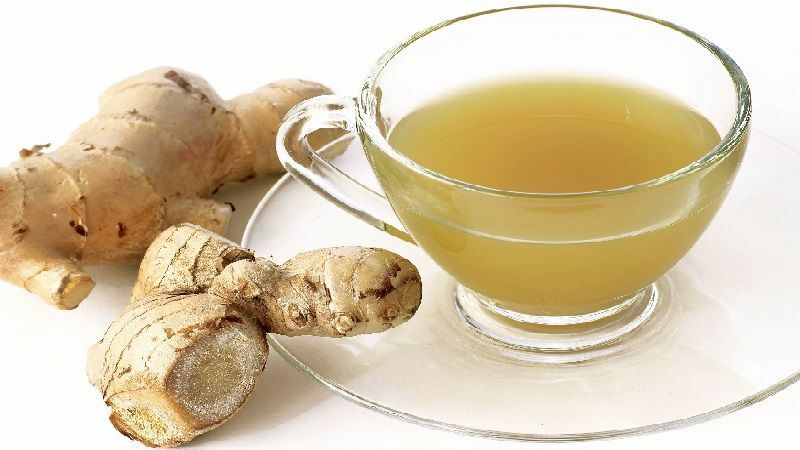 The gingerol alkaloid present in the ginger tea helps in lowering the blood pressure. When the pressure in the blood vessels reduces, it allows easier blood flow. It has blood-thinning properties, which prevents heart attacks. In these ways, ginger tea helps in improving the circulation of the blood. Ginger tea has soothing and calming effect on the mind and the body. It can relieve stress and tension. Only a cup of tea can improve your mood and gives feeling of freshness. Ginger is proven to reduce the cortisone levels in the body. So, if you are stressed, then not use unhealthy relaxation methods. Just take one cup of ginger tea. It will relax you better. Studies have shown ginger tea contains the very strong antioxidant properties. It can prevent pre cancerous cells from growing. Drinking ginger tea kills the free radicals in the body and lesser the risk of having cancer. If you have already cancer, also ginger tea will help you to detoxify the body. Ginger tea lowers the bad cholesterol level in the blood. It also helps reducing total cholesterol level and triglycerides levels in the blood. This action helps to prevent heart diseases. If you have elevated cholesterol level, then you should take two or three cups of ginger tea daily. Ginger Tea is LIKELY SAFE when prepared from 3 to 5 grams of ginger paste or grated ginger roots. However, some people make ginger tea using one tablespoon of ginger paste, which is equivalent to 15 grams. In this amount, ginger tea may have side effects. Heartburn: In low dosage, ginger tea can help reducing heartburn and digestive ailment. However, when dosage of ginger tea, especially when it is prepared with more than 5 grams ginger, then it cause heartburn and burning sensation in abdomen in some people. Nausea & Vomiting: Again low dosage is beneficial in nausea and vomiting. The higher dosage of the ginger tea (especially when it is prepared with more than 5 grams ginger) causes nausea and vomiting with sour vomitus and burning sensation. Low Blood Pressure: Although this effect is very rare, but it occurs only in people who have already history of having low blood pressure. Drinking ginger tea more than a half cup, or tea prepared with more than 2 grams ginger paste is not recommended for pregnant women. Excess amount of ginger tea may cause contractions and menstruation. There is not particular information about the breastfeeding moms, but stay on the safe side. Do not use ginger tea more than a half cup (prepared with less than 2 grams ginger paste) per day. Bleeding Disorders: Women having heavy menstrual or uterine bleeding or people with bleeding disorders should avoid using ginger tea. Because ginger stimulates circulation and increases blood flow. Surgery: Use of ginger tea has strong blood thinning properties. So, if you are planning a surgery of any body parts, then avoid using of it at least three weeks before a scheduled surgery. If you are under any medications, then consult to your doctor before taking ginger tea because some blood thinning medicines like ASPIRIN and WARFARIN may interact with ginger tea. It can be a strong side-effect taking both at same time. Don’t use if you are allergic to ginger or any ingredients use in making ginger tea. If you’re trying to gain weight, then don’t take ginger tea. Drinking ginger tea may potentially reduce your weight by increasing fat metabolism. Overdose of ginger tea may be harmful. If you already have low blood pressure, then avoid using it.